Reporter Community has launched its NEWS token sales to support further development of its verified media content marketplace to fight fake news. I hope it will succeed. I have a small investment. How can i mine this coin? Best of luck with the project people! Hi @ethanosburn, thanks for your encouragement. The NEWS token cannot be mined, it's minted through our smart contract on Ethereum - you can purchase using your existing crypto or fiat if you're an accredited investor. 1. Major news agencies confirmed their intent to test our blockchain implementation: DPA (Germany); Keystone (Switzerland) AAP (Australia); APA (Austria). 2. We’re in talks to cover the upcoming Winter Olympic Games in Korea. 3. A number of discussion are ongoing with high profile investors at our roadshow. 4. Listening to the voice of the community we opened up all tiers for public participation. Come and join us in making news trustworthy again. Talk to us on t.me/news_token. Hi, thanks for upping the project. How do we amend details (time, bounty, etc. ), which have been revised meanwhile? Hi team! We opened the block with comments a few days ago. Several people have already left comments on your ICO page: https://icoholder.com/en/ico/ico-4263. It would be great if you will follow your page and help your potential investors. I hope it will succeed. Verified media content is very important these days. A large increase in fake news floating around us. This blockchain based project will help fight against most of the fake news before it is published. Whitelisting of NEWS token has started. From now on those registered on our website can send Ether to our token sale address with correct data and gas limit values. You find Reporter's address for the NEWS token sale on our website. Your NEWS tokens will be immediately sent through a smart contract to your ETH address, and they will be able to trade after 26. Feb. 2018. Hurry to http://www.reportercommunity.tech, register and get the 42% extra tokens now - yes, that's a 30% discount. As always, give us a shout on https://t.me/news_token and let your friends now on https://twitter.com/NewsToken. We're partnering with wallet providers to make the access to our token sale easier. Keep tuned in, we'll release information shortly. Due to the rise in ETH price since our project start the Reporter Community team decided to revise the pricing of NEWS token. We want to remain accountable to the community, and stick to our word. We'll only raise what we need so other great projects and teams can also get a fair chance. Now you can get 3500 NEWS for 1 ETH plus any bonuses. The IIIrd, (closing part ) we will show the values of all the blockchain based - news related - project incl. SNIP, stereo, drive, DECENT, picture, etc. WAY to the MOON! 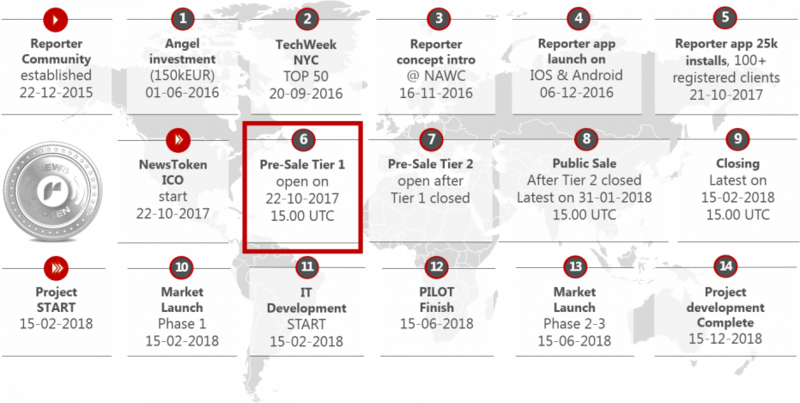 NEWStoken ICO is OPEN! Register at reportercommunity.tech , get whitelisted, contribute, and be a part of the future of NEWS! #xem #xrp and #eth accepted! Our new video about Reporter's NewsToken is out! Check this! What is Reporter? What is NEWSToken? How can you take your part of the future of the media? If you don't want to read long articles about us, just check this video!